Today I will write about another one of my addictions. It is only until after starting this blog that I discovered how numerous they are hahaha. Today I will be talking about the oldest and earliest of my addictions… Disney! Why Disney all of a sudden? Well because I am going to a Disney store tomorrow!... And I’m pretty much hyped up because of that hahha. It’s the first time that my mom is also going to a Dutch Disney store… So with a little bit of luck I will be able to convince her to buy some things as well, so as to add them to our collection hahaha. Ever since I was a child I have loved the Disney movies. Now that I am 21 years I think my addiction is even bigger hahah. I have almost every Disney movie. The only exception is The Hunchback of the Notredam. That movie is just so sad and there is so much injustice (even though in the end they all live happily ever after) that somehow I have never been able to sit through it entirely. I do absolutely love the songs. Especially the song that Esmeralda sings: ‘God help the outcasts’ (and no I am not religious). For those of you who do not know it yet, here is a youtube clip. (If you cry easily, I suggest you first fetch your box of tissues before viewing it). Over time my love for Disney has certainly grown. Next to Disney music and Disney dvd’s I have purchased several Disney Christmas decorations (yes we actually had a Disney tree last year which did not have one branch which was free), however there are too many of those so I won’t be able to show you guys in here. I have about 5 Disney t-shirts (one which is newly added to my wardrobe thanks to my best friend how was sweet enough to bring me a souvenir from her trip to Disneyland Paris…. It’s the cutest Thumper t-shirt you have EVER seen), I have I don’t know how many Disney plushies (I won’t bore you with those) and I have several Disney statues. Here is a small selection of the small statues that I own. They are mostly Disney Traditions (which is the more affordable brand). (Yes I actually have Snow white and all seven dwarfs). (it plays the tune: a dream is a wish your heart makes). And I have a piece of what is called Olszewski’s gallery of light. You can switch on the light in the box, causing the stars to sparkle…. Ooohhhh sparkles!!! 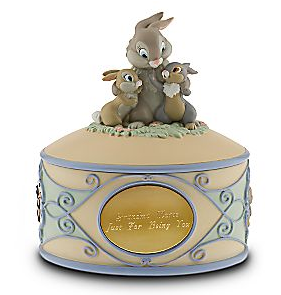 And this is what might be called the crown on my collection, even though it is rather simple: It’s a musical keep sake box featuring thumper with his mother and sister. When I saw this, I simply fell in love with it. It plays the tune little April shower… and it’s just too cute! On the side they have painted Flower and Bambi. Well I think that was enough hyperness and Disney for everyone of my readers, so I will leave it at that. I hope you have enjoyed looking at a part of my Disney collection. I will make sure to create a post during Christmas on some of my Christmas Decorations. Some of them are really really cool. it's all soo cute.....*drools* ^^"
I'm glad you all like it :D.